"Big Cap Companies — RM10 BILLION TO RM40 BILLION MARKET CAPITALISATION / HIGHEST RETURNS TO SHAREHOLDERS & GROWTH IN PROFIT AFTER TAX OVER THREE YEARS: INDUSTRIAL PRODUCTS & SERVICE: Press Metal Aluminium Holdings Bhd - In The Major Leagues | The Edge Billion Ringgit Club 2018"
The year 2017 was one of many firsts and key achievements for Press Metal Aluminium Holdings Bhd, Southeast Asia’s largest integrated aluminium producer, as well as its founders. FBM KLCI and the MSCI Malaysia Index in December last year, the group also record an all-time -high revenue of RM8.17 billion in the financial year ended Dec 31, 2017 (FY2017), with a net profit of RM593 million. The meteoric rise in Press Metal’s share price also catapulted its co-founder and group CEO Tan Sri Paul Koon Poh Keong and his brother Poh Ming into Forbes Malaysia’s 50 Richest list for the first time in 2017. They were ranked 13th with a net worth of US$1.1 billion last year before rising to the eighth spot with a net worth of US$3 billion this year. It was in 1986, when the country was mired in an economic crisis and jobs were scarce, that Paul — with a newly minted degree in electrical engineering from the US and the youngest of seven brothers — roped in his older siblings to start an aluminium extrusion business. Born and raised in Selangor, the Koon brothers pooled together US$50,000 and started the business with almost zero knowledge. The family was involved in hardware and trading. Within seven years, the Koons had listed the company on the Second Board of the Kuala Lumpur Stock Exchange and transferred it to the Main Board in 1999. At the time of writing, Press Metal was Malaysia’s 25th largest listed company with over RM19.1 billion in market capitalisation — slightly lower than the RM20.66 billion it ended last year with, but still triple the RM5.9 billion the company was valued at just two years ago at end-2016. Press Metal shares gained 413% during the evaluation period of June 30, 2015, to June 29, 2018, translating into a three-year compound annual growth rate of 72.46% — the highest returns among The Edge BRC Big Cap companies. 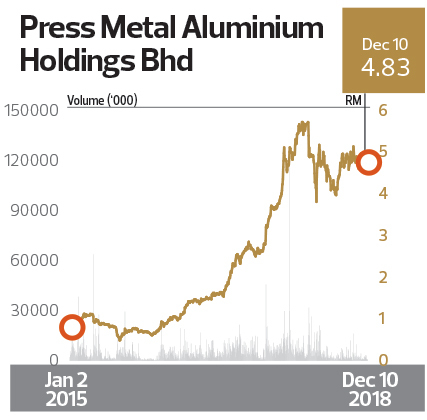 It was only in 2013 that Press Metal’s market capitalisation stayed convincingly above the minimum RM1 billion market cap that qualifies it as a The Edge BRC member, although the company did cross that threshold in early 2011. Strong earnings growth contributed to its rise. Its profit after tax registered a three-year CAGR of 41% during the awards evaluation period, rising from RM214.91 million in FY2014 to RM602.8 million in FY2017. The group also achieved double-digit return on equity in the last two financial years — 23.3% in FY2016 and 26.5% in FY2017, significantly higher than 6.9% in FY2015. Press Metal has been consistently paying dividends over the past three years. The company paid a total dividend per share of eight sen in FY2015, 10 sen in FY2016 and six sen in FY2017. However, due to its stellar share price performance, its trailing 12-month dividend yield was only 1.3% at the time of writing. Currently, Press Metal has a smelting capacity of 760,000 tonnes per year and an extrusion capacity of 160,000 tonnes per annum. Its three smelting plants — in Mukah and Samalaju Phases 1 and 2 in Sarawak — have production capacities of 120,000 tonnes, 320,000 tonnes and 320,000 tonnes respectively. Its two extrusion plants — in Foshan, China, and Kapar, Selangor — have production capacities of 120,000 tonnes and 40,000 tonnes respectively. The company, whose aluminium smelting plants in Samalaju are operating at full capacity, has been facing challenges to obtain more power supply from state utility company Sarawak Energy Bhd. In order to meet growing capacity needs, Press Metal, which has been expanding purely via organic growth in the last seven to eight years, is currently on the hunt for acquisitions. The group kicked off its acquisition trail in February by acquiring alloy rod producer Leader Universal Aluminium Sdn Bhd for RM96 million. In June, Paul reportedly said the next acquisition target could be either the upstream or downstream, and likely abroad. At the time of writing, two research houses had a “buy” call on Press Metal while three others said “hold”. Their target prices ranged from RM4.10 to RM5.69, averaging RM5.07, Bloomberg data shows. Press Metal will continue to win favour and stay in the major leagues if it can continue growing its earnings.